As I sat at the austere wooden table, a litre of HB Maibock in one hand, a fresh giant-pretzel in the other, watching the commotion around the bar as stein after stein was sent out to the desperate masses, I couldn’t help but question (if even for a brief second) whether I was still in Sydney – or whether I had somehow been transported to a modern Beerhaüs in the centre of Munich. 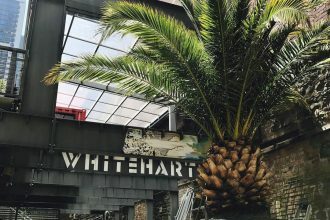 Either way, I can’t think of many better places to blow off some steam and enjoy some quality food and bevvies with mates on a Friday evening. The much-loved Bavarian restaurants and bars around Australia have a certain unique charm to them that make them difficult to pass-by. 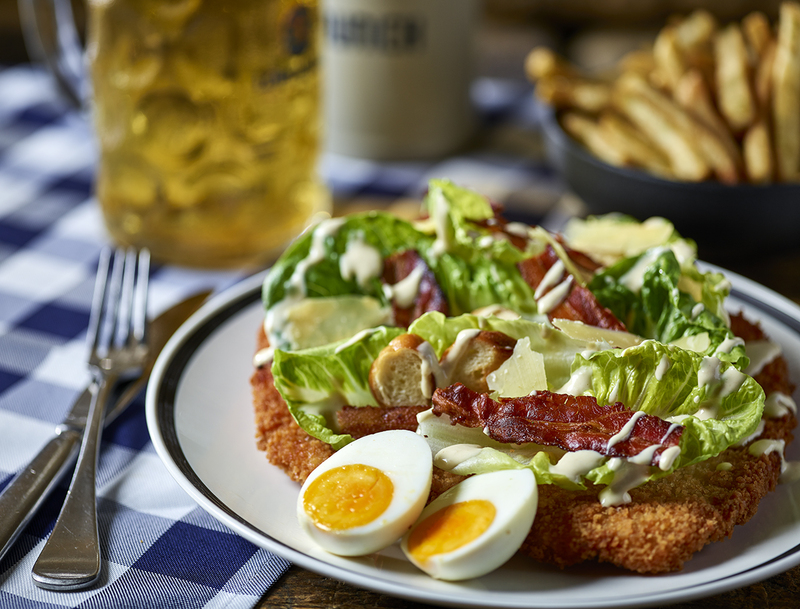 They’ve become a staple of post-work drinks and weekend meals around the country, and they now have a whole lot more to love with the launch of their new range of Loaded Schnitzels. Each golden-crumbed chicken schnitzel ($30) is generously smothered, covered and loaded with gorgeous toppings and sauces, creating quirky fusions of some of the world’s most popular cuisines and flavour combinations. It’s pretty much like having two meals in one. Oh, and did we mention the six-stack-chicken-cheese-gargantuan that is The SchnitzelMeister? A literal tower of schnitty. 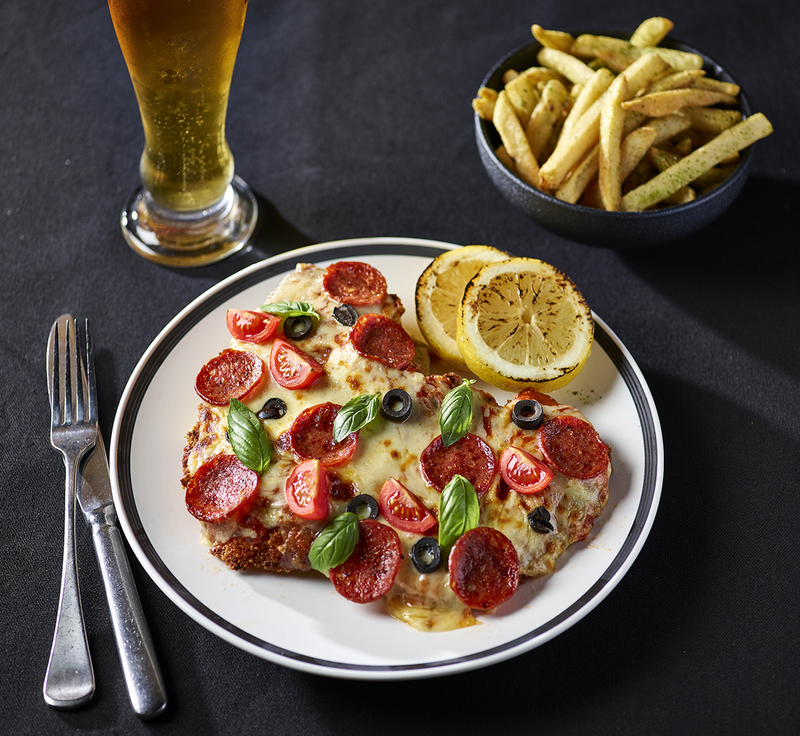 The Italian loaded schnitzel bursts with Mediterranean flavours; topped with a beautiful Napoli sauce, mozzarella, pepperoni, cherry tomatoes, olives and basil. They say everything’s bigger in Texas, and that certainly rings true here. The Texan is supersized with fries, mozzarella, smoked bacon, jalapeños, sweet BBQ sauce and creamy ranch dressing. Can’t decide whether to have a schnitty or a salad? Have both with The Caesar, which is piled with cos lettuce, smoked bacon, parmesan, Caesar dressing, pretzel croutons and a slow-cooked egg. Italy and Germany come together once more for The Meatball which ticks so many different boxes you won’t crave food for a month. With spaghetti, house-made meatballs in Napoli sauce, parmesan and basil. 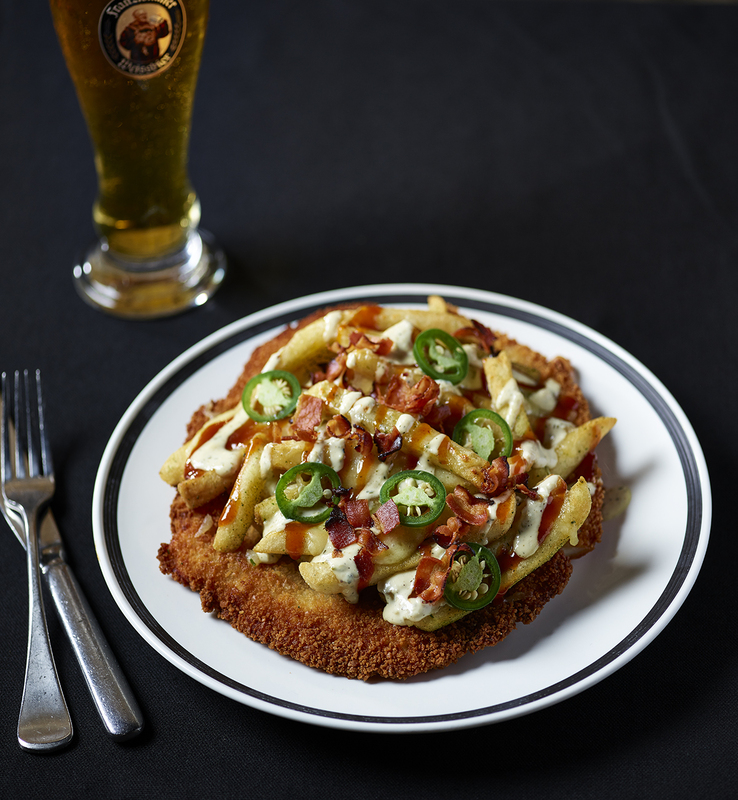 The last (and my personal favourite) of these five great monuments to schnitzeldom is The Mexican, which is back by popular demand, and features corn chips, chilli con carne, Jack cheese, fresh-pounded guacamole and sour cream. 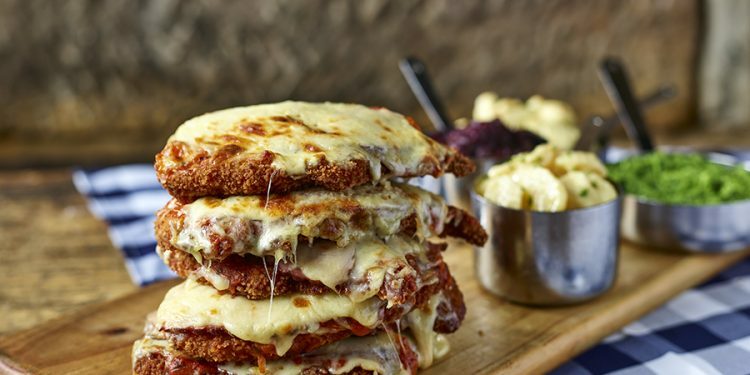 But of course, the real challenge is taking on The Schnitzelmeister ($80) – a 1kg, six-stack, chicken schnitzel tower topped with Napoli sauce, ham and cheese and served with four side dishes. 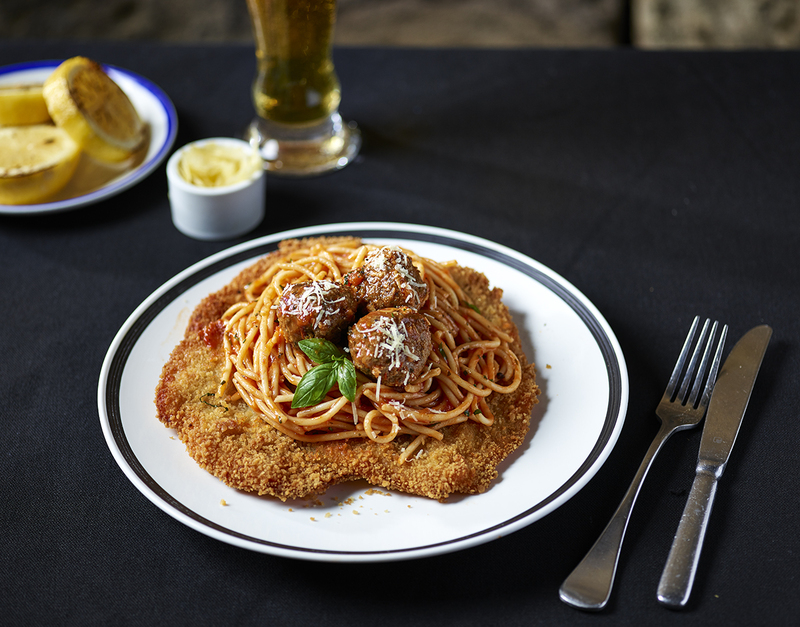 Finish The Schnitzelmeister (including all side dishes) in under one hour and receive it for free. Challenge accepted (and failed by yours truly). But what did we think of the whole experience? Our server, Jennifer, was phenomenal, the atmosphere and aesthetic was pretty spot-on, and the food itself didn’t miss a beat (despite myself and a mate failing to even make a dent in the The Schnitzelmeister). I couldn’t recommend this experience highly enough – just prepare for the debilitating stomach pains as your body feebly attempts to digest the monster that is The Schnitzelmeister.